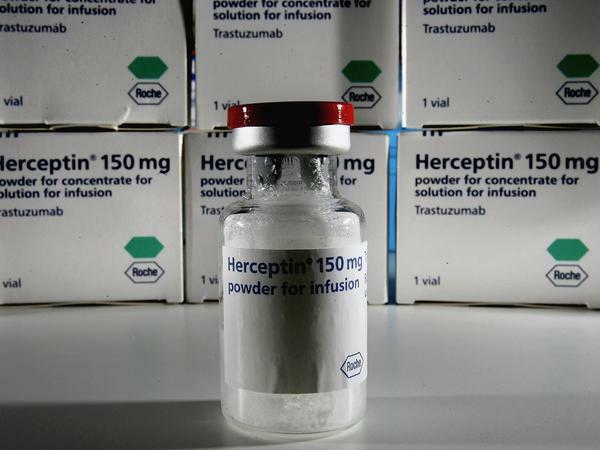 Herceptin has proved to be effective in prolonging the lives of the 12 percent of women with breast cancer whose malignancy hasn't spread to other organs, and whose cancer is HER2-positive. But side effects can be a problem. "The headline result is 'six months is as good as 12 months,' " says oncology researcher Dr. Helena Earl from the University of Cambridge in the United Kingdom. She presented her results Wednesday in a teleconference for journalists, which highlighted findings that will be presented in early June at the American Society of Clinical Oncology's annual conference. Earl and her colleagues recruited more than 4,000 women who had been diagnosed with breast cancer that had not spread to other organs, and whose cancer expresses high levels of a protein called HER2. The drug Herceptin is effective in prolonging lives of women whose cancer is HER2-positive. Half got standard treatment, which is given over the course of 12 months. The other half received treatment for six months. The objective was to see whether giving less of the drug would be just as effective, while sparing women the side effects that are common with this treatment. Herceptin's list of possible side effects can range from headache, diarrhea or sleep problems to severe coughing, bone pain or heart problems, among other symptoms. This kind of question — of whether the standard, established dose could be reduced to good effect — is one that drug manufacturers don't go out of their way to answer once a drug is on the market, because the result could reduce the amount of drugs they sell. So in this case, the "Persephone" study got funding from the British government. Survival was nearly identical after five years, and side effects were much less common with the briefer course of the drug. Typically, 8 percent of women who get treated with Herceptin have to drop the treatment because of heart damage. Those on a six-month course had that risk cut in half, Earl said. Women suffered fewer other side-effects as well, such as cough, fatigue, pain and heart palpitations. She called the as-yet-unpublished findings "exciting first results," and said she was confident they "will mark the first steps toward reducing treatment duration for many women with HER2-positive breast cancer." Dr. Bruce Johnson, president of ASCO, said one benefit of this change would be to reduce the cost of treatment, both to women and to health insurers. "We think this is an important thing for the 12 percent of women who have early-stage HER2-positive breast cancer," he said. Even though the report covers the results after five years of study, there were relatively few deaths in either group, so researchers can't yet say for sure whether the long-term benefits are the same for the two treatment options. As a result, "it may be a bit early to make a definitive change in practice," Johnson said. ASCO's chief medical officer, Dr. Richard Schilsky also added some notes of caution. "When we see the results from a clinical trial, we're looking at the average results for the patients in that population," he said. "There may well be some women in the population who do not do as well with six months of treatment." It's possible that further analysis of the data could identify those women who would still benefit from the year-long treatment, he said. "Personally I find the results quite compelling," he added. "And it is likely that it will signal a shift" in how doctors prescribe this drug to their early-stage breast cancer patients.